If your house is a 1908 historic house in Olympia, a 1940’s craftsman in Tacoma or a newer home in Dupont or Lacey you shouldn’t be afraid to experiment with color! Peeling Paint From The Inside Out. Sometimes peeling paint is an “inside out” issue. Take a quick read and make sure you are causing your next paint job to be more expensive! Choosing Your Paint Color - Don't Suffer from Paralysis by Analysis! The Flying Colors team converted these stained cabinets to an updated look. This process saved the homeowners thousands of dollars. Cabinet refinishing is a terrific way to breathe new life into your kitchen. Your cabinets are one of the most visually prominent aspects in a kitchen, and a new coat of paint can make a significant difference for your kitchen’s overall look and feel. With new paint, you don’t need to buy a whole new set of cabinets or replace countertops to create an entirely fresh look and make your old kitchen feel like new again. Moreover, cabinet refinishing is a much higher quality process than just “painting” your cabinet, not to mention it is better for the environment. As a Certified Green Business, we are always looking for ways to improve our environment. 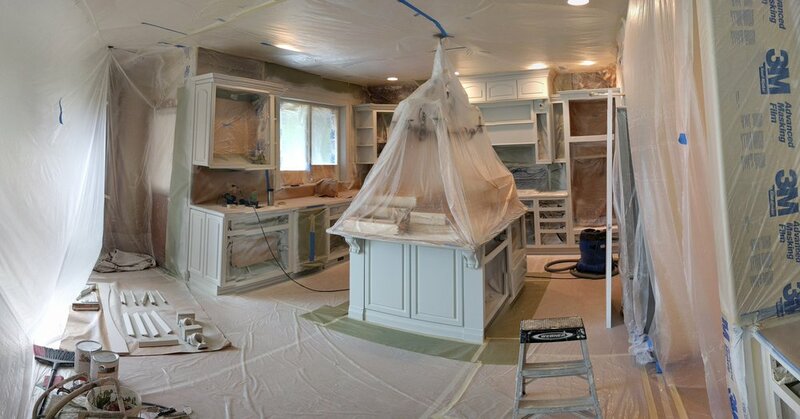 Cabinet painting requires a lot of masking and protecting of the home. When you’re refinishing your cabinets, you’ll be able to choose from a variety of color options. A change in cabinet color can strongly alter the whole room’s aesthetic. For example, if you’ve have light stained cabinets, a bold red paint could give your kitchen some pop and a fresh look. We are seeing a lot of folks choose white, gray, and navy blue. Sometimes even a combination of those colors. Most often people are choosing to finish their cabinets with an enamel finish giving the final product strength and durability as well as a washable surface. Enamel finishes come in a variety of sheens from high gloss to matte. If you are looking for ideas on what kind of finish or color to choose for your home, head over to our Pinterest page and do a little homework. When you get inspired give us a call. There is a lot to consider if you are thinking about having your cabinets painted. Should you repaint your cabinets or just get new cabinets installed? Should you just paint them yourself? Here are some things to consider in making this decision. Can you paint cabinets yourself? Sure. Will you get the results that a professional painter is able to accomplish? No. Most often our process for painting kitchen cabinets is to disassemble your kitchen cabinet doors and drawers, sand the box faces, and spray or roll the boxes. Then the process on the drawers and drawers is to sand, prime (sometimes multiple coats), then apply enamel (usually 2 coats). Between all these steps there is also hours of masking, dry time and caulking of cracks, splits and gaps. What is the condition of your countertop? Most often new cabinets will require new countertops. If you are happy with your current countertops or don’t have it in the budget to replace them, painting your cabinets may be the right answer. I like my cabinets, but they are outdated. What can you do for me? Are you happy with the current condition and layout off your cabinets? If you like the quality and function of your cabinets, why mess with a good thing? 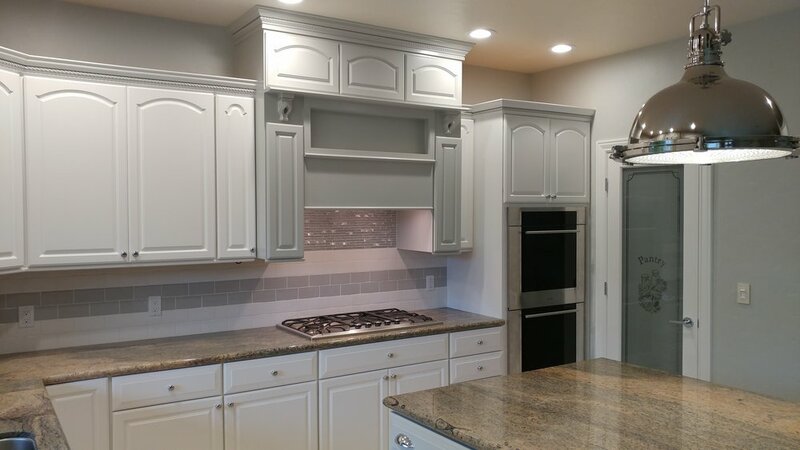 Quality cabinets are very expensive and if you are replacing high quality cabinets just to change the esthetic, you may be a viable candidate for having your cabinets painted. This sounds expensive, what is it going to cost? Cost will be relative to the size of the kitchen. If you have a nice kitchen with marble, quartz or some other high-quality countertop you can expect to save up to 70% by refinishing your cabinets rather than replacing them. Some projects will not see this type of savings but expect to save at least 30% or more for every job compared to buying new cabinets. Are there cheaper options? My cabinets are plywood, what can you do for them? There are less expensive process that can be done for plywood cabinets. Not every cabinet needs the “full meal deal.” Recently we painted cabinets in a rental property. The owner knew they needed to improve the look of the home but didn’t want to take the time or invest more money to replace the cabinets. For a fraction of the cost, the Flying Colors team sanded, primed and painted the cabinets. No, this isn’t the same as the extensive process performed on high-end cabinets, but it was a way to get an updated look for a rental property for a fraction of the cost and time. Before - High quality cabinets with an outdated look. After - Cabinets painted by Flying Colors Painting - Crew leader Lynne. A pipe broke under the sink at my house and now I am at the homeowner in need of contractors.